MILWAUKEE — A year ago, Randy Wolf put together a career-best season with the Dodgers. From start to finish, Wolf was one of the league’s most consistent pitchers as he posted a handful of career-best numbers, including 214 1/3 innings pitched and a 1.101 WHIP. 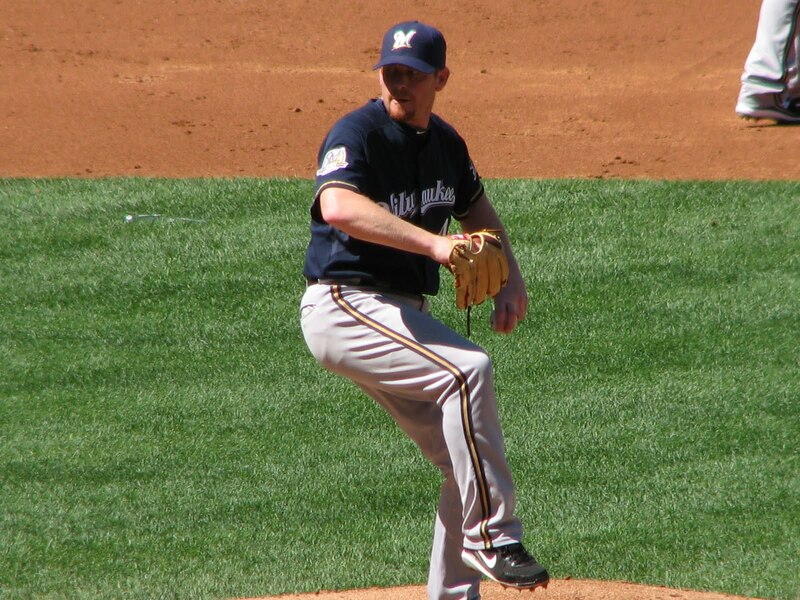 Opening the 2010 season with the Milwaukee Brewers, that consistency seemed to escape Wolf. He looked nothing like the pitcher he was for Los Angeles, stumbling out to a 4-6 record with a 5.31 ERA through 13 starts in the first two months of the season. “I just knew something wasn’t right,” Wolf said of his struggles. Over that stretch, Wolf mixed in impressive outings: He tossed six scoreless innings at Pittsburgh on April 20 and seven scoreless against the Astros on May 25. More frequently, however, Wolf struggled, as he did in allowing eight runs over 4 2/3 on June 9 to the Cubs. As he watched his club’s newly acquired veteran left-hander struggle, Brewers pitching coach Rick Peterson struggled himself as he searched for an answer. “You’re trying to pinpoint what exactly it is. Why exactly is he struggling? What’s different from the year before and this year?” Peterson said. If his stuff was the same early in 2010 as it was throughout the last three seasons, why were Wolf’s numbers so much more inconsistent? Following his rough outing on June 9, Wolf bounced back, going 3-2 with a 3.25 ERA over his next seven starts. Wolf’s next start after that stretch, July 21 at Pittsburgh, was his worst yet. Entering with a 4.56 ERA, Wolf surrendered a career-high 12 runs on 13 hits over 5 2/3 innings pitched, causing his ERA to jump to 5.20. While that Pittsburgh outing certainly was forgettable, the silver lining was that it marked the date Peterson and Wolf finally figured out what change was necessary. “The difference from this year to the past, was that he just wasn’t making pitches,” Peterson said. “For whatever reason, he was missing location consistently. Everything else was the same, but that makes a huge difference. But the question that remained was how to get Wolf, who told Peterson in Spring Training that he liked to keep his tempo slow, to speed things up with his delivery. Recognizing that Wolf typically operates with a much more athletic, upbeat tempo when not pitching, Peterson used another sport to explain to Wolf the importance of tempo. What did Wolf think of the comparison of the tempo in his delivery to his golf swing? “I think that he thinks I’m a better golfer than I am,” Wolf quipped. “But it makes sense. Even as an amateur or beginning golfer … with anything you do a rhythm is very important. Since getting touched up for 12 runs in Pittsburgh two months ago, Wolf has quickened the tempo in his delivery, while paying closer attention to what a different rhythm can do to his pitches. At times, he has found the need to slow it down a bit, while speeding up at others. In nine starts since that outing against the Pirates, Wolf has looked as good as he has all season. Wolf is 4-2 with a 3.07 ERA over that stretch, allowing just 20 runs in 58 2/3 innings of work. Wolf also has put up his two most impressive performances of the season in the same stretch: He tossed 8 1/3 innings of three-hit, one-run ball in St. Louis on Aug. 18, and gave up just one run on four hits in eight innings in his last outing on Sunday. It took nearly four months, but Wolf is finally pitching with the kind of consistency that the Brewers expected him to show when signing him to a three-year deal in the offseason. With four starts remaining this season, Wolf is still focused on what he can do in 2010, though he certainly hopes to put together a more consistent 2011 campaign. After his last start, Wolf talked about wanting to start strong, stay strong and finish strong. While the first two months may have gotten away from him, it’s hard to argue against the way he’s closing out the season. “It’s frustrating at times, but when you get 33-34 starts, you keep on learning and just get better. I look at those bad games as an opportunity to get better, learn from it and just move on,” Wolf said. MILWAUKEE — If his start in left field on Wednesday turns out to be his last in a Dodgers uniform, Manny Ramirez certainly went out on a high note in a 5-4 win over the Brewers at Miller Park. Before the club’s second game against the Brewers, the buzz surrounding the Dodgers involved the club having reportedly placed Ramirez on the waiver wire. In his third game back from the disabled list, Ramirez showed why he’s generated so much interest. With a double into the right-field corner in the third inning, Ramirez snapped an 0-for-7 streak at the plate since returning from the DL. “Manny had a real good night,” said Dodgers manager Joe Torre. “When he gets his timing, that’s where he starts, hitting the other way. Then he had the big base hit, the RBI base hit. That was huge for us too. Ramirez certainly seemed to have figured out his struggles, putting together an impressive night as he alternated walks and doubles. Ramirez finished 2-for-2 with two walks, two doubles, an RBI and a run scored. Most importantly, Ramirez’s two-out double in the sixth drove in second baseman Ryan Theriot for what proved to be the deciding run. With a scheduled day off Thursday for Ramirez as the Dodgers play a day game after a night game, Wednesday’s performance may have come in Ramirez’s final start with the Dodgers. If Ramirez was indeed put on waivers Wednesday, and if he is claimed by another club, he could be traded as soon as Friday and no later than Tuesday. As long as he’s still with the team, the Dodgers hope Ramirez’s bat can help them get back in the National League Wild Card race. Ramirez was stranded after a first-inning walk and thrown out at the plate attempting to score from second after his third-inning double, ending the frame. In the fifth, he walked again with one out, and came around to score on a Loney single. While Ramirez led the offense, right-handed starter Hiroki Kuroda — who also was reported Wednesday as having been placed on waivers — delivered a strong performance for his first win since July 22. Kuroda, who admitted he didn’t have his best stuff, went seven innings for the fourth straight start, giving up four runs on seven hits while striking out six as he did not walk a batter. After a giving up a big three-run inning to the Brewers in the fourth, Kuroda and the Dodgers’ bullpen combined to limit Milwaukee to just two baserunners the rest of the way. While Kuroda went deep into the ballgame, the late innings continued to be an adventure for the Dodgers as Torre used four different relievers for the final two frames. After Jonathan Broxton shut down the Brewers in order in the eighth, Torre turned to a three-man closer unit for the ninth, matching up Ronald Belisario, George Sherrill and Octavio Dotel for one batter each against Ryan Braun, Prince Fielder and Casey McGehee. Former Dodgers lefty Randy Wolf was roughed up in his first start against his former team, giving up four runs on seven hits over just five innings of work. Wolf (10-10) also walked three batters and recorded four strikeouts. Andre Ethier put the Dodgers on the board first in the third inning with a solo home run, his 20th of the season. A three-run fifth — highlighted by Theriot and Casey Blake doubles — and a final run in the fifth gave the Dodgers their second straight win. With the Giants having lost to the Reds in extra innings Wednesday afternoon, the Dodgers moved to within 5 1/2 games of the Giants and Phillies, who are tied for the lead in the National League Wild Card race. Having won the first two games in Milwaukee, the Dodgers secured at least a series victory over the Brewers and will look for the sweep on Thursday. The series win is the Dodgers’ first on the road since taking two of three from the D-backs on July 2-4. “My goal for this team right now is to get ourselves five or six in a row under our belt, so we can know when we go to the ballpark that we expect to win,” Torre said. “We haven’t been able to string it together. CHICAGO — Randy Wolf said earlier this week that he expected to make his scheduled start Saturday. Three days after being hit by a line drive on his left wrist, it appears that will be the case. When asked about Wolf on Monday, manager Ken Macha didn’t share the same outlook as the veteran left-hander. Instead, he pointed out that the off-day Thursday would allow them to push Wolf back from Saturday to Tuesday. Wolf said Wednesday morning that as long as he continued to feel OK, he would be on track to make his start Saturday. Following a pregame bullpen session, Wolf’s mindset remained the same. CHICAGO — When Hunter Pence ripped a liner back up the middle off Randy Wolf in the seventh inning of the Brewers’ 5-2 loss on Sunday in Houston, the Milwaukee left-hander couldn’t get out of the way. Since that ball struck Wolf’s left wrist, though, he’s dodged quite a bullet with his health. An MRI scan of Wolf’s wrist confirmed what an X-ray revealed Sunday, that Wolf had no fractures despite being struck with the line drive. “I don’t think there was anybody around that area at the time that didn’t think it was a broken wrist,” Wolf said. “But I got lucky. I dodged a bullet. Wolf was diagnosed with a bruise and was scheduled to be reevaluated by the Brewers’ medical staff Monday after playing catch before the game to determine how much time, if any, he will miss. His next scheduled start would be Saturday, again against the Astros, but this time at Miller Park. In Wolf’s opinion, he’s not likely to miss that start. Brewers manager Ken Macha, on the other hand, may take a more cautious approach.